While Buffalo’s Canisius College has long been a fixture on the local college basketball scene, it enjoyed a particular prominence in the 1940s and early 1950s. A significant segment of that legacy was the work of the latest Golden Griffin to be inducted into the Greater Buffalo Sports Hall of Fame – Joe Niland. After an outstanding career at Tonawanda High School from 1933-1937 (All-Western New York in basketball and football his senior year), Niland starred in basketball at Canisius from 1938-1942. He was a participant in the 1942 All-American College All-Star Game in Chicago in 1942, as representative of a program guided by Ally Seelbad that was beginning to achieve national recognition. After serving with General Patton’s armored division in Germany from 1943-1945, young Niland returned to Canisius and fashioned a spectacular, if brief, coaching career that really put the Golden Dome on the national basketball map. The post-war years were glory days at Canisius. Niland posted the second-highest winning percentage in school history, a noteworthy achievement in light of the schedule routinely faced by the Griffs. Buffalo was becoming an attraction for major college teams, heading east to Madison Square Garden, and Canisius regularly played (and beat) national powers such as Duke, Arkansas, Utah, Texas, Wyoming, Notre Dame, and St. Johns. In 1950-51, Canisius topped a CCNY team, which became the last to win the NCAA and NIT tournaments in the same year. During this period, Canisius ranked in the top 25 nationwide on many occasions. Niland coached many great players during his tenure at Canisius, including Leroy Chollett, Hank O’Keefe, Herman Hedrick, and Bob MacKinnon. 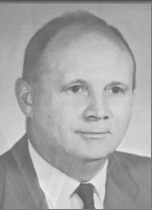 More importantly, he recruited several stars that carry the Griffs’ successful program forward in the 1950s, including Johnny McCarthy and Hank Nowak. Niland took the helm at Ryan High School in 1955, and his 1959 “Foxy Five” squad was the first in school history to reach the Manhattan Cup Finals. His teams later won back-to-back cups in the mid 1960s, and were league runners-up in five other seasons. Niland served as a scout for the new Buffalo Braves franchise in 1970-72, and was instrumental in securing the services of Bob McAdoo and Randy Smith, two keys to the team’s later successes. He also scouted for the Cincinnati Reds in the 1960s, and spent 10 memorable seasons as an aide to Buffalo Bills general manager Bill Polian. As varied as his athletic involvement has bee, however, it was on the basketball court, and behind the bench, where Joe made his lasting contributions, efforts, which have landed him in the greater Buffalo Sports Hall of Fame.